Pasha and I met by complete chance during New York Fashion Week last year — we were both staring at the same piece of jewelry, scratching our heads as to what the artistic intent was and, more importantly, how one was to wear the beast. Sometime in jewelry, the artists forget that it’s supposed to be worn — but that’s another can of worms. Pasha’s got an interesting story. He grew up in Tehran in a family of aesthetes, jewelry and fashion lovers. Listening to him talk about his upbringing, I could visualise the extreme elegance and refinement that has always been a trademark of Iranian society. 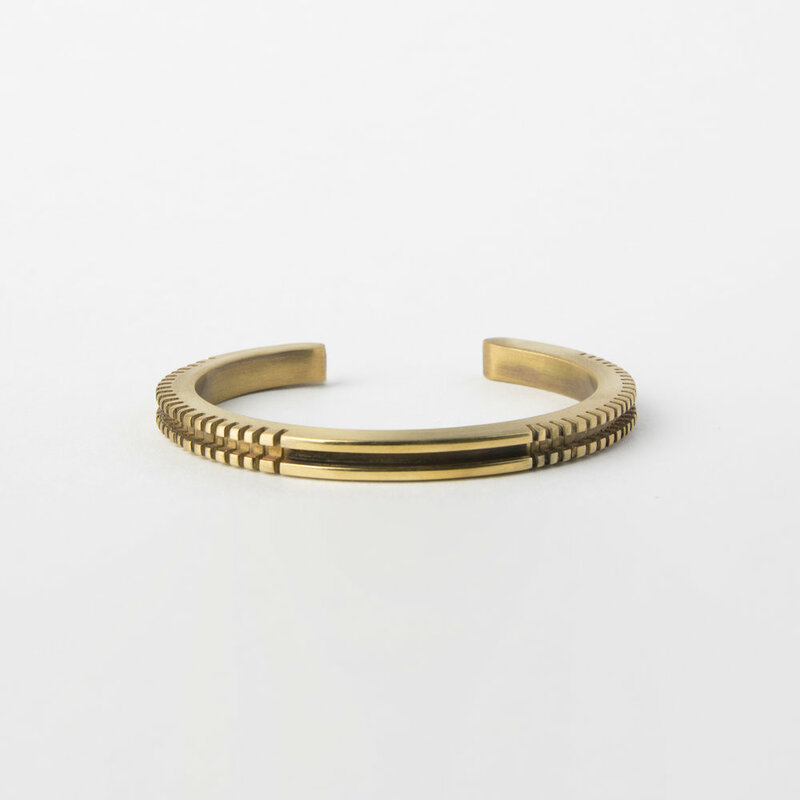 His father, a furniture maker, privileged a minimal approach and has been a great inspiration to Pasha’s jewelry. Pasha was always fascinated by jewelry and he remembers being told off for staring at women’s cleavage. His move to Vancouver at age 17 was the beginning of his journey towards a formal jewelry education that lead him to open his own studio and create his own collection. It was not as straightforward as that of course — the extent of his “art training” in Iran was limited to repurposing wood scarps from his father’s furniture workshop to make doodahs and other fun stuff. So it took a lot of catching up to be accepted in college and university programs. The freedom of western society is both exhilarating and confusing for a young man coming from a society where representation of the female body is forbidden. It took a while to figure out the cultural and family balance, to find his own self. But perseverance, hard work and taking chances lead to his success in creating a line of jewelry that displays both skills and creativity and is very much a representation of his personality: strong, no nonsense but full of nuance and elegance. This silver cuff is a one-off but I encouraged him to develop it into a collection. It shows maturity in design and technique, and I would wear it in a second. 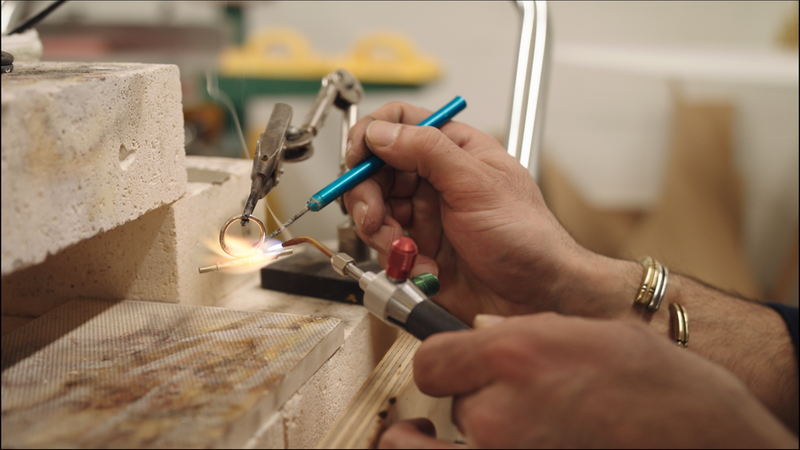 His studio door opens on heavy industrial equipment, unexpected in a jewelry studio. He shares his space with Jacob, a self taught cabinet maker. It’s a perfect set-up for cross pollination of skills and ideas. Pasha uses both heavy machinery and traditional jewelry skills, precious stones and common metals, masculine designs with a touch of lightness. I’m not sure how he does it, but his pieces marry themselves very well with all sorts of other jewelry styles. Put it with pearls or wood, diamonds or silver, it just fits. Here are a few of my favs. There are more on Pasha’s website. Use code RP10 at check out to receive your special Rue Pigalle discount on his jewelry. Or even better, pay him a visit.